Chocolate never lasts long in our house. John is always asking me to pick him up a chocolate bar to satisfy his sweet cravings. There was a time not too long ago that I used to eat a chocolate bar every single day. I have had to cutback and now enjoy it as a special treat from time to time. I savour each sweet morsel even more now since I don’t eat it that often. We are both fairly picky with our chocolate too so I was curious to see how we would like Green & Black’s Organic Chocolate. The fact that it was organic intrigued me and I liked that it was a higher quality than I was probably used to. This is a company that uses fair trade and ethical business practices and is known internationally for its organic chocolate. Their trademark is the organically grown Trinitario cocoa beans and the extra conching time (constant stirring) to bring out the intense flavours. I was sent six Green & Black’s Organic Chocolate Bars in various flavours to try out. I tried a piece and then had John bring them into work to share with his coworkers. I guess he works with a lady who has a serious sweet tooth and was highly anticipating her chocolate taste testing! The Milk Chocolate bar was a hit. It was both smooth and creamy and “yummo”! They use more cocoa mass than the majority of milk chocolate producers and it really comes out in the taste. The Almond Milk Chocolate bar is made with whole Mediterranean almonds with the skins on to give a more nutty flavour. The almonds combined with the rich creaminess of the milk chocolate makes for a sinfully delicious experience. This one was my personal favourite. I liked the extra crunch of the almonds. The Mint Dark Chocolate bar was John’s favourite. It was the perfect blend of fresh mint and the rich chocolate. The mint filling wasn’t what we expected and was like the consistency of a caramel chocolate bar. It was delicious! John’s coworker, Val, said this bar was better than mint patties. She is a huge dark chocolate lover and said the taste was “awesome”. 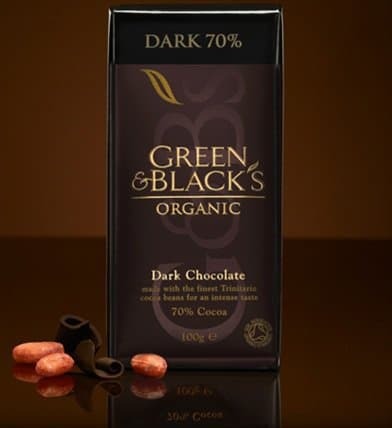 The Dark Chocolate bar is made from 70% cocoa solids. The flavour is stronger than milk chocolate for sure. I prefer milk chocolate and I don’t think I could eat a whole 100 g bar of milk chocolate in one sitting. It’s great though to grab a quick piece to satisfy that chocolate craving. The Maya Gold is a dark chocolate bar with orange and spices.This one is definitely a different flavour than what we are used to. I liked the spiciness of the nutmeg and cinnamon and thought it was a refreshing change. 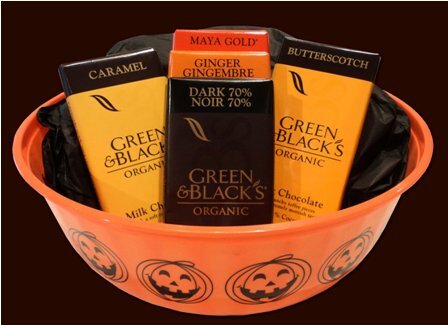 The Ginger is a dark chocolate bar with crystallized ginger pieces. I wasn’t crazy about this one because I don’t really like ginger. Val and John said it would not be one they would probably go out of their way to buy. If you are a fan of ginger though, you will probably enjoy this one. I would also like to try Green & Black’s White Chocolate Bar, Caramel Milk Chocolate Bar, Raisin & Hazelnut Milk Chocolate Bar, and the Butterscotch Milk Chocolate Bar. They all sound amazing and I am impressed with the quality of this brand!